Hi-Rez Studios' Realm Royale is changing up the battle royale format with a new gameplay idea: character classes. Players can choose between five different classes and fight amongst each other until only one Champion remains. Like its battle royale counterparts Fortnite and PlayerUnknown's Battlegrounds, Realm Royale blends survival skills with intense player-on-player combat, forcing players to fight over resources to figure out who will be the last man standing. But the game's class system, wide range of weaponry, and crafting components shake things up a bit, giving players a unique take on one of the gaming world's most popular genres. For new players, here's what you need to know before diving into Realm Royale. 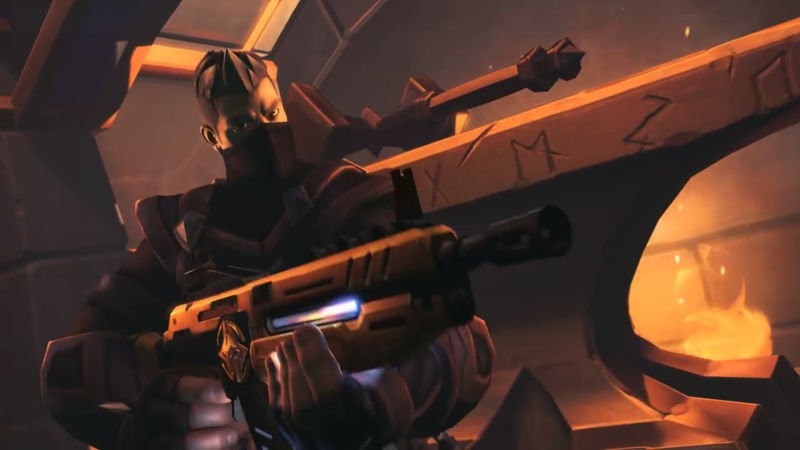 Unlike Fortnite and PUBG, each player starts Realm Royale by choosing one of five classes. Once you pick a class, it cannot be changed during your match. Each class has their own special abilities and passive bonuses. Here's the full list. Each class receives five different unique abilities that can only be used by your class. The Warrior, for example, can use the Heroic Leap to jump incredibly far and high, making this a great ability for escaping a powerful enemy or engaging a weak opponent. The Assassin, on the other hand, can use a Smoke Screen to block their opponents' line of sight and catch them by surprise. Abilities used by one class cannot be exchanged for another's found on the battlefield, so once you pick your class, you're locked into their abilities. Ammunition is infinite in Realm Royale, so there's no need to worry about scavenging for ammo—you'll never run out of shells for your shotgun or arrows for your crossbow. Instead, winning in Realm Royale is all about looting for armor upgrades, swapping out your weapons for better versions, and changing your abilities to use the best ones available in any given situation. In short, you'll want to do plenty of scavenging out in the field while playing Realm Royale. Items are either dropped from dead players or stored in chests, which spit out various items after being opened. Different kind of chests exist throughout the game—weapon chests store weaponry, and standard chests feature armor, abilities, and weapons—but when in doubt, open up everything you see. 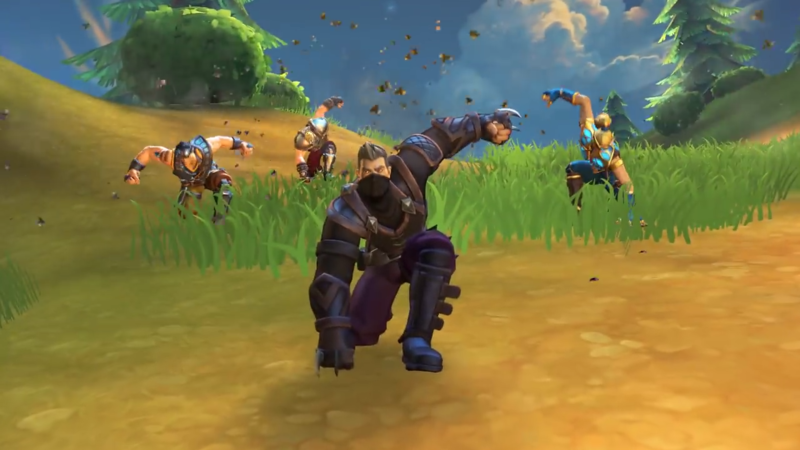 Realm Royale stands out from its competitors for many reasons, and that includes the game's crafting mechanic. Players can head to several in-game Forges and craft legendary armor and weapons. 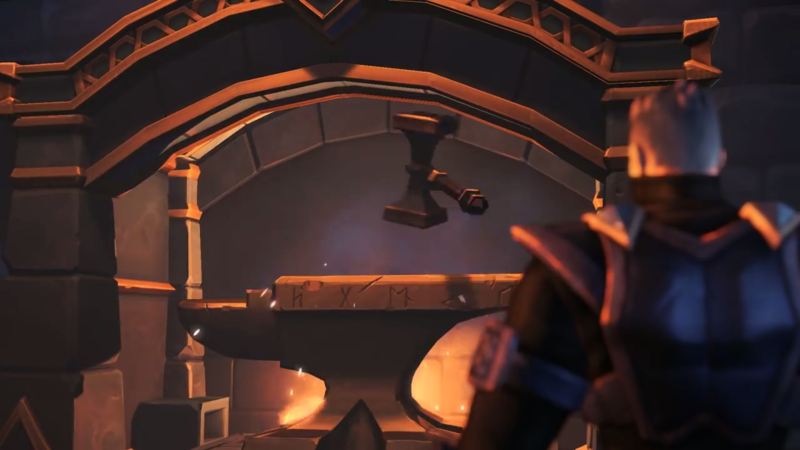 In order to create legendary items, players need to collect Shards, which are a crafting resource that can be taken from other players or grabbed through disenchanting weapons, abilities, items, and other forms of loot. New items can be crafted by heading to the Forge's yellow ring and using the crafting menu to create items. Forging a weapon takes 120 Shards and an additional Chicken Trophy, which can be obtained by killing chickens 30 seconds after their deaths, whereas legendary armor simply requires 60 Shards. All items take 60 seconds to craft, save for health and armor potions, which only take 30 seconds. But be careful while you're at the Forge. Other players will be there too, trying to improve their own weapons, and the Forge will spew smoke into the world that lets other players know that you're crafting items. If you're going to the Forge, go with a few buddies—or at least make sure you're prepared for a fight. 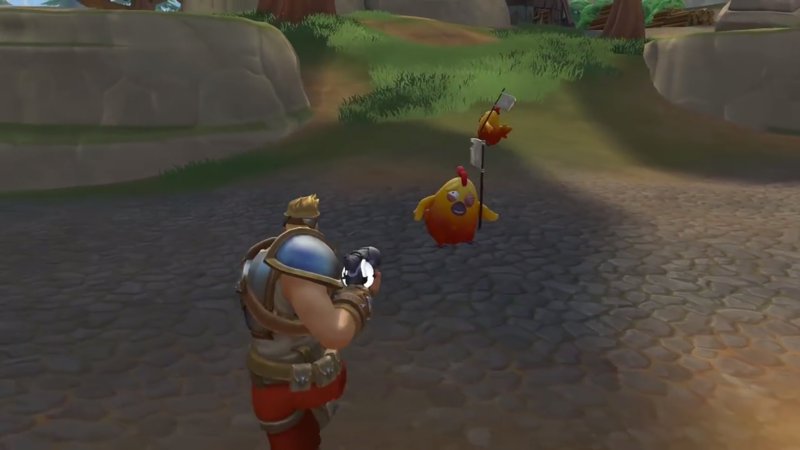 Realm Royale stands out from other battle royale games for plenty of reasons, but one of the biggest changes is its chicken mechanic. Yes, that's right. You get to play as a chicken. After players lose all their health, they turn into a chicken and wander around the battlefield for 30 seconds while waving a white flag. Players who survive for half-a-minute are brought back into the game with all their items and abilities. But while you're stuck in chicken mode, you cannot use any of your weapons. And yes, other players can kill you. If that happens, it's game over. Players can only respawn as a chicken three times before permanently losing the game. And if an enemy player kills you while you're jumping around as a chicken, then you won't be revived. Try to hide from other players or confuse them in order to avoid being killed. Players can check their chicken spawns through the feather counter at the game's bottom-left corner. 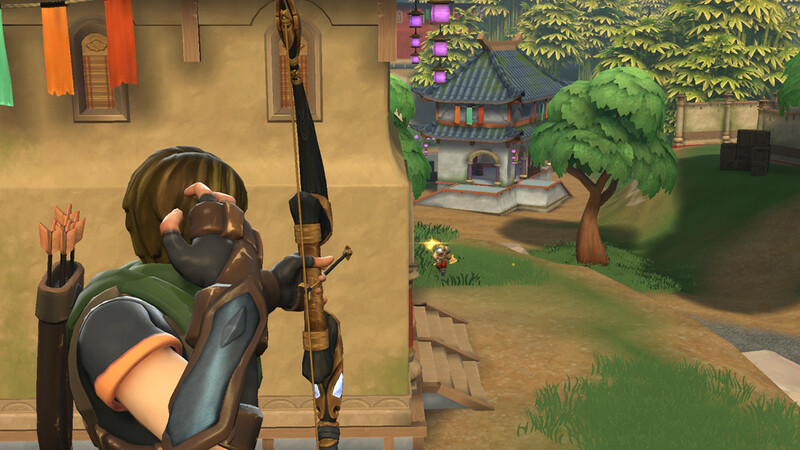 While Realm Royale adds classes into the battle royale formula, it has a lot in common with other games from the genre, like PUBG and Fortnite. Players jump from a blimp and dive down onto a map that's populated with loot, and they have to stay in the game's white circle in order to avoid dying from the world's deadly fog. But unlike PUBG or Fortnite, Realm Royale starts by delineating its white circle on the game's map. That means players can strategically choose where to drop before they even leave the blimp. Hovering just outside the circle or towards a small set of buildings inside the play area is generally the best idea, as it gives you the opportunity to collect some loot and weaponry without going head-to-head with other players immediately. Like other battle royale games, map awareness and pre-planning play a major role in staying alive. You should constantly take time to loot your local surroundings, searching for better armor, items, weaponry, and abilities to raise your chances for survival. Anything you don't like can be disenchanted into Shards. Oh, and when in doubt, avoid large cities. That's where most of the fighting takes place.